Be the first to share your favorite memory, photo or story of Bessie Douglas. This memorial page is dedicated for family, friends and future generations to celebrate the life of their loved one. Bessie Douglas, a.k.a. Brandi Downs, 86, of Hattiesburg passed away on March 25, 2019. Visitation will be Monday, April 1, 2019 from 2 P.M. until the Memorial Service at 3 P.M. at Moore Funeral Home in Hattiesburg. Mrs. Douglas graduated from the Mississippi University for Women with a Master’s in Fine Arts in 1955. 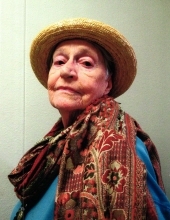 She was an artist in the Jackson Square of New Orleans from 1964 until 2006. She moved back to Hattiesburg in 2010 and began teaching an adult arts class at the University of Southern Mississippi. She was also a member of the South Mississippi Art Association and the Hattiesburg Arts Council. She is survived by her three children, Martha Anne Morgan of Florida, William Kilpatrick Douglas, Jr. of Hattiesburg, and Christine Rachel Solis of Louisiana; three grandchildren, Shira, Hannah, and John-Michael; one great grandson, Grayson; and two nieces. In lieu of flowers the family ask that donations be made to the South Mississippi Art Association at www.southmississippiart.org. To send flowers or a remembrance gift to the family of Bessie Douglas (Brandi Downs), please visit our Tribute Store. "Email Address" would like to share the life celebration of Bessie Douglas (Brandi Downs). Click on the "link" to go to share a favorite memory or leave a condolence message for the family.